KOAH Spearguns was created out of necessity. To own a speargun that is powerful, easy to track, and most importantly accurate. All without having to follow a band chart or alter your aiming to account for power changes. These guns are not built by masses of hourly employees. They are built by a handful of builders, in our 3000 sq ft facility, hand focusing on every detail building them to last and perform. Every cut, turn and shape in the speargun serves as a purpose in function to aid in aiming accuracy and tracking. The trick was making it look good. 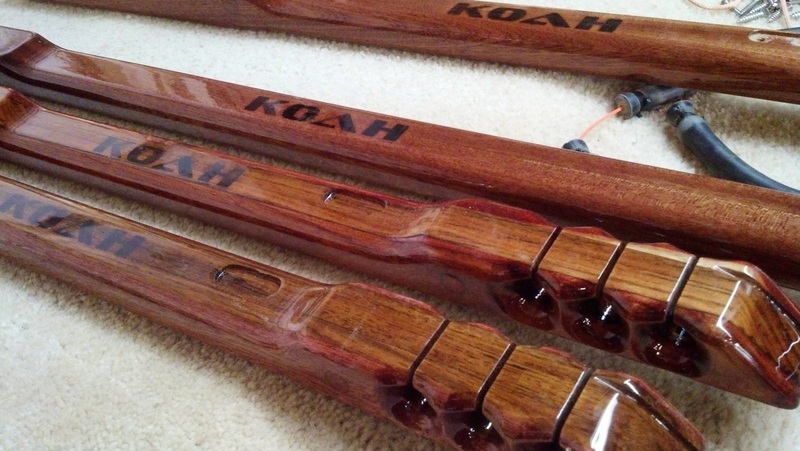 KOAH has set out to raise the bar in quality of spearguns, and we stand behind every aspect of our product. How it all Begins .. 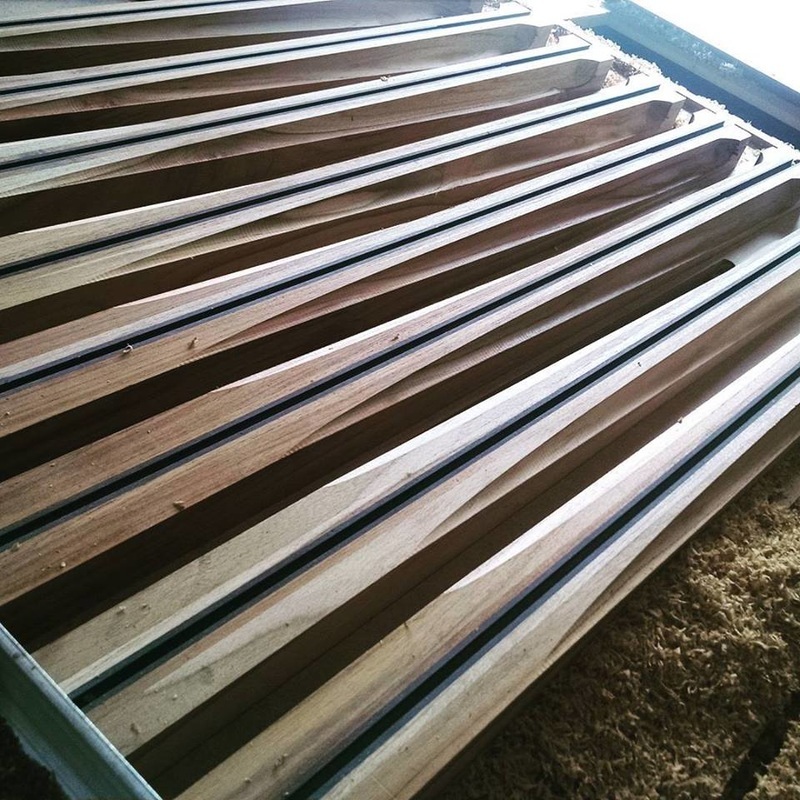 The building process for all KOAH spearguns starts at the "rough sawn lumber" stage. 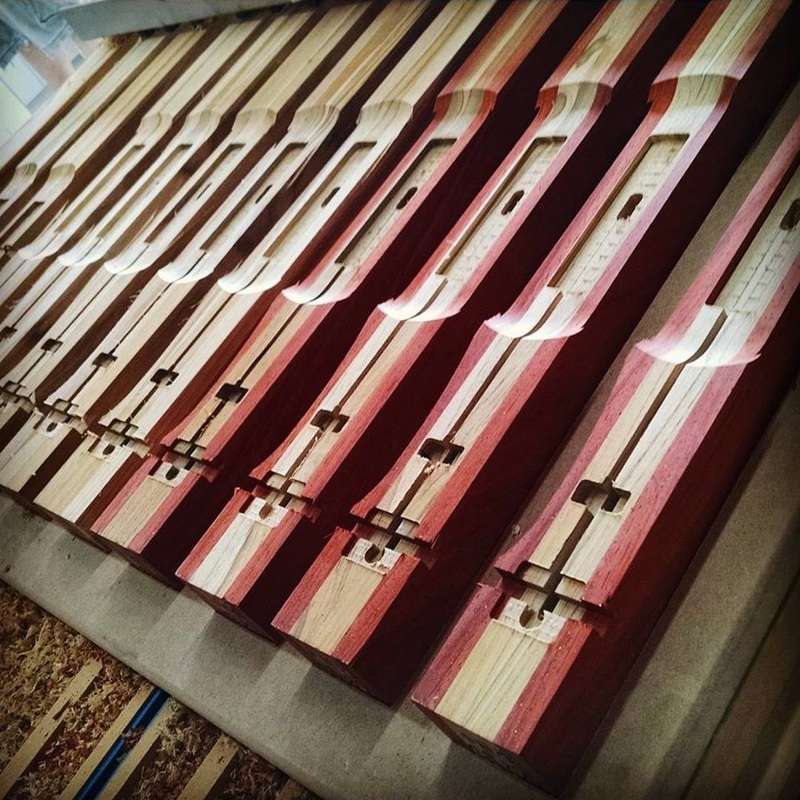 Whether its Burmese teak, Sipo Mahogany, Purple heart or Padauk, All lumber is of the highest grade FEQ and FAS quality. Majority of the lumber is hand picked to help ensure straightest boards. 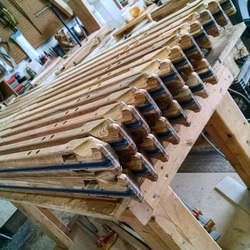 After lumber is straightened milled and cut to size. Any rips that warp past 1/16 of an inch are discarded. Each exotic hardwood behaves differently therefore different numbers of laminates and thickness. After coating the laminates with the highest grade marine epoxy, the blanks are sent to our press where they are heat treated to 150 degrees to relax the grain and further promote a straight board while being put under an even 1000ft/lbs of pressure to obtain an incredibly strong bond. Blanks are then hooked and hung to age in their natural state, vertically. Using high end industrial hydraulic slide saws, we straighten the aged blanks to within 1/64in tolerance. With our one of a kind jigs the wood can only mill to a perfect 90 degrees. Then its off to the router tables and industrial sharpers for precision shaping to ensure flawless round-overs and clean mass removal. Enclosed track of 9/32, 5/16 or 3/8 is cut, trigger mechanism pocket is removed and band holes are cut. This is followed up by primary shaping of the entire gun along with fit and finish of the line anchor and handle. After shaping, the guns go off to finish sanding where any normal marks from blade vibration, transitions and curves are all brought to uniform smoothness. Solid lead ballasting is then added to balance the speargun and counteract re-coil. Bluewater and Tuna guns are sent to the water tank for custom ballasting. Then base coats of a UV protective epoxy are applied followed by 3 finish coats of our own rock hard UV protective clear coat that provides years of protection from all the elements.